This week, the Tuesdays with Dorie bakers baked Sweet Cream Biscuits. 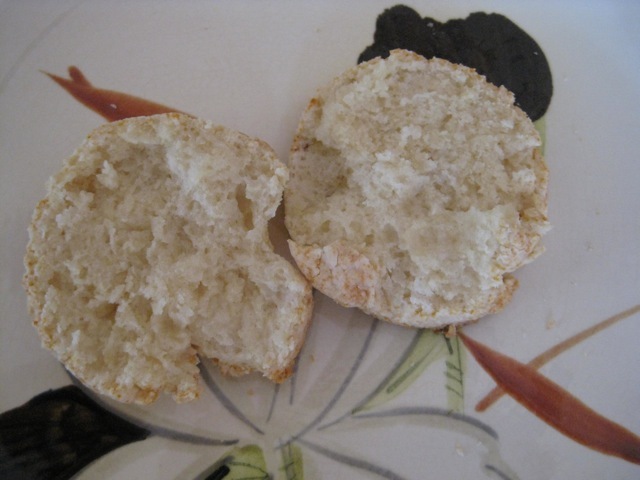 Most of my biscuit experience involves the cardboard tube that you rap on the countertop until it bursts open. Well, these are almost as easy to make! I wanted them for breakfast, so I got up, baked them while still in my jammies, and was eating one before I was lightheaded from hunger. This recipe was selected by Melissa from Love at First Bite. I “met” Melissa when I got her name for the TWD holiday card exchange in 2008, and her blog has been on my regular reading list since then. Along with the TWD recipes, she’s got a lot of great looking things out there. In fact, I just took a look and remembered that I want to try the Malaysian Chicken Pizza she posted in February. Check out her lovely photos, delicious recipes, and cute boys! What I did: I made half the recipe and got six biscuits. I baked two of the biscuits and froze the rest for baking in the future. Is it a huge waste of energy to heat up the oven to bake two biscuits? Probably, but if I would have baked more, I would have eaten more. How it went: Aside from worrying about handling the dough too much, these were really easy to make. Whisk the dry ingredients, mix in the cream, pat to 1/2″ thick, cut into circles, bake. Not having much biscuit-baking experience, I was amazed that these have just cream and no butter. How it tasted: I ate one right out of the oven, half with butter and half with butter and jam. The texture was crisp on the outside and amazingly soft and fluffy on the inside. This was a wonderful breakfast treat. When my husband got up, I told him to eat the biscuit right away because it might still be a little warm. I think he was generally confused about where the biscuit came from and why I was making him eat it, but he said it was very good and gave it a thumbs-up. He’s not too chatty in the morning, so that was a really good review. I’m looking forward to baking the frozen ones another day! If you would like to give these a try, look on page 23 of Baking: From My Home to Yours. You’ll also find it posted on Love at First Bite today. Side Note: I am going to New York City in a few weeks. If anyone has restaurant, shopping, or sightseeing suggestions, please leave them in the comments or email me at bakewithjill [at] gmail.com. Thanks! I agree these were super easy and delicious!!!! How wonderful ! I still haven’t made mine !! What a great idea to freeze them & bake them off later! I ate one with butter hot out of the oven and it was delicious. Wow, those look perfectly done, now you don’t have to rap the tube on the counter any more, right? 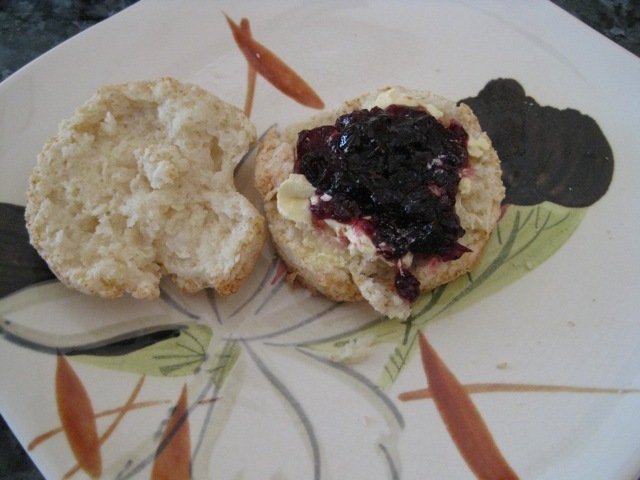 I’m not a big biscuit lover, but I am sure loving looking at all the jams…yours looks rich and wonderful. Smart to freeze some, Wish I woulda. LOVE NYC! We ate at Bobby Flay’s Mesa Grill. Maybe best food I’ve ever had. The blue corn muffins alone were divine, let alone the whole meal. And Levain Bakery—chocolate chip walnut cookies. You cannot go to NYC and not try them. Those and Jacques Torres CCC’s. They are different from Levain, but up there at the top of my list. Oh there’s so many more places to go there. Sigh. I need to go back. 😉 Have fun! yum, sounds like a great breakfast! I love the image of the sleepy husband being fed a biscuit. Well done! You have AMAZING willpower to only make two biscuits. They look delicious and super light and fluffy! Your biscuits look great. These would be the perfect breakfast with a little butter and some yummy jam. I wouldn’t mind being told to eat one when I wake up. Haha, I don’t make biscuits very often, but we’re also big fans of the ones that come in the cardboard tube 🙂 It looks like your homemade ones turned out just as good though – glad they were a hit! Mine weren’t very successful, but this recipe is so easy I’ll probably try again eventually. These look fab – what a great idea to make them for brekky. Your biscuits turned out great! Such restraint to only bake two (and not eat both before your husband woke up). I almost always get up earlier on weekends and feel like I’m shoving treats at my boyfriend before he’s really ready to eat. Well Jill…. I wouldn’t be very chatty if you were trying to feed me some strange biscuit – 🙂 These DO look wonderful – both of them! I usually have trouble with biscuits but these came out pretty good! I loved these too. It’s amazing how easy they are to mix up. Your’s look great! they look fluffy and tender and all in all, yummy! i love your husband’s reaction–too cute! Haha I love that you wrote that most of your biscuit experience involves rapping a tub on the counter and popping it open! These look amazing – your crumb is beauitful! Almost too easy to be soooo good. Mine didn’t rise much, but were still good.